Figure 1: The alchemist by the painter William Fettes Douglas (1822-1891). Alchemy seems to have been born in China as early as the 4th century BCE with the chief goal of Chinese alchemy being the prolongation of life. 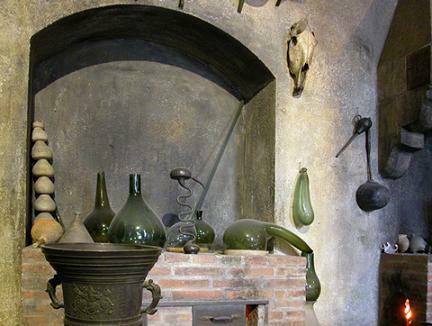 Alchemy is next heard of in Egypt in the early Christian centuries. In its beginnings, this ancient practice of chemistry was shrouded with superstition and magic. 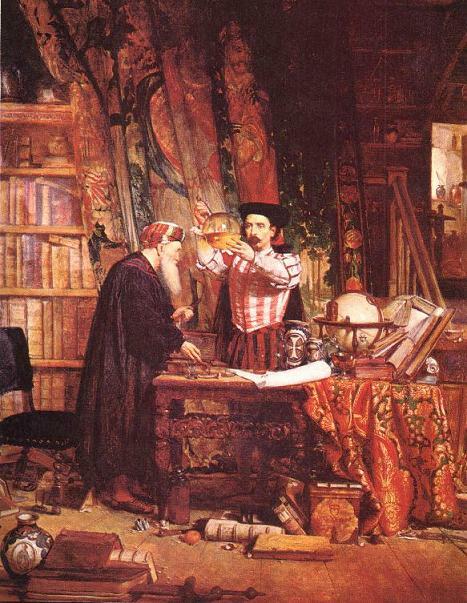 In this early period, the ideas and recipes of the alchemists were drawn from Greek science, religion, philosophy, various strands of folklore, and had many connections with astrology and other branches of occultism. The theoretical basis of ancient alchemy was rooted in a basic range of beliefs including that all matter consists of the four elements: earth, air, fire, and water, in various combinations (this theory was first put forward by Aristotle); that gold is the "noblest" and "purest" of all metals, followed by silver; that the transmutation of one metal into another is possible by an alteration in the admixture of the elements; and finally that base metals may be turned into noble ones by means of a precious substance often called the fifth element or quintessence. Such theories and beliefs produced a great deal of experimentation, including experimentation on the making of glass, leather, and cloth, the working of metals, and in the preparation of drugs. It was, however Islamic chemists who rid alchemy of such folklore and occult practices. Repeatedly, Islamic scientists denounced the mixing of the occult beliefs with science. In a famous chapter of his Muqaddima (Prolegomena), Ibn Khaldun thus denounced as fraudulent the practice of applying a thin layer of gold on top of silver jewellery, as one of many perversions in the use of metals. For him, the Divine wisdom wanted gold and silver to be rare metals to guarantee profit and wealth. Their disproportionate growth would make transactions useless and would "run contrary to such wisdom". Figure 2: Laboratory of alchemy reconstructed in the Deutsches Museum. (Source). Centuries before Ibn Khaldun, Al-Kindi wrote specifically against such transmutations, warning against alchemists transforming ordinary stones into precious stones. Al-Kindi's work is in fact adequately titled Kitab at-tanbih 'al khata' al-kimiyyawiyyin (the book for warning against the Alchemists.) It was Al-Kindi who distinguished alchemy (as the exclusive pursuit of transmutation of the baser metals) from its more respectable sister, chemistry. Considering the time of Al-Kindi, this distinction must be regarded as quite a remarkable achievement. There are more Islamic figures within chemistry than is generally acknowledged in the literature on the subject. This literature when writing on Muslim chemistry is very poor, below standard, either rubbishing Muslim accomplishments, identifying them with the occult, and generally stressing the role of only one Muslim'alchemist' Jabir Ibn Hayyan. On the other hand, more recent literature such as that of Eilhard Wiedemann provides a strong outline of Muslim chemists beginning with the Umayyad Prince Khalid Ibn Yazid (d. 704), then, of course we have Jabir Ibn Hayyan and Ibn Wahsiya (fl 870) who wrote chemical works which were subsequently used by Al-Dimashki in his Geography. Then came al-Razi and Ibn Umail al-Tamimi who lived either in the 8th or 10th centuries, and wrote Miftah al-hikma al-'uzma (which is kept in Leiden; Cat. No. 1274). Al-Farabi (d. 950) also wrote on chemistry, and was succeeded chronologically by a chemist from Spain, Al-Majriti (d. 1007). Then back to the East, we have another Al-Khwarizmi al-Khati (fl. 1034) (not the mathematician), who wrote Ain al-San'a wa awn al-Sunâ' (The essential of the Art and the Help for the Workers). In the 12th century came to prominence the famous vizier-scholar Muayid al-Din al-Tughrai (d. 1122) who wrote numerous works such as Kitab al-anwar wa'l mafatih, then Mafatih al-rahma and Anwar al-hikma (kept in Paris No. 2414). Later in the same century flourished Abu 'l Hasan b. Musa b. Arfa Ra'a (d. 1197) who is the author of Shudhur al-dahab (The Gold Spangle). In the early 14th century we have Muhammad b. Ahmad al-Iraqi Al-Simawi, then the famed Al-Djildaki (c. 1342), and finally Abu'l Ashba b. Tammam (d. 1361). Figure 3: Frontispice of Alchemiae Gebri Arabis philosophi solertissimi libri (Bern, 1545) (Source). The first Islamic chemist is commonly considered to be Jabir Ibn Hayyan (722-815). Generally, scholarship when dealing with Islamic chemistry, in general, and his chemistry, in particular, has focused on the tedious, obscure, and un-scientific aspects of Jabir ibn Hayyan's work. Yet, ibn Hayyan's scientific achievements are considerable, including his writings on chemical properties in Al Khawass al-kabir (the Great Book of Chemical Properties), on weights and measures in al-Mawazin, Chemical combinations in Al-Mizaj, and dyes in Al-Asbagh. He also built a precise scale that weighed items 6,480 times smaller than the kilogram (anticipating Dalton by ten centuries) and defined chemical combinations as a union of the elements, in minute particles too small for the naked eye to see, yet not suffering from a loss of character. Ibn Hayyan also pioneered the basic chemical operations of sublimation, liquefaction, purification, oxidation, amalgamation, crystallisation, distillation, evaporation, and filtration. He also gives recipes for making cheap, illuminating ink for manuscripts, and mentions the use of manganese dioxide in glass making. Ibn Hayyan was also acquainted with citric acid and other organic substances. He identified alkali acids, salts, paints and greases, and prepared sulphuric acid, nitro-hydrochloric acid (used to dissolve metals), caustic soda and a multitude of salts such as sulphates, as well as nitrates, potassium and sodium carbonates; his association of metals and salts promoting foundry techniques and glazing processes for tiles and other ceramics is also noted. Ibn Hayyan also describes processes for the preparation of steel, the refinement of metals, and also for dyeing, marking varnishes to waterproof cloth, preparing hair-dyes, etc. Thus, a much vaster repertoire than we usually find in other poorly researched literature. Following ibn Hayyan is another Muslim chemist, al-Kindi. Al-Kindi was born in Kufa about 803 and studied at Baghdad, becoming highly reputed at the courts of al-Mamun and al-Mutassim as a scientist and philosopher. Al-Mutassim also chose al-Kindi as tutor to his son Ahmad. Al-Kindi, as an experimental physicist, appears as a man who is in tune with the chemical laboratory in Kitab kimiya' al-'itr (Book of the Chemistry of Perfume), signaled by H. Ritter in an Istanbul manuscript and edited in 1948 by Karl Garbers. It contains more than 100 recipes for fragrant oils, salves, aromatic waters and substitutes or imitations of costly drugs. It is a systematic treatment of the subject, occupying almost sixty pages of the printed Arabic text (ninety-nine folios in the MS). 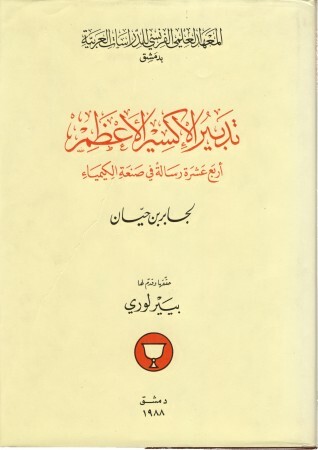 Figure 4: Front cover of the edition and French translation of Tadbîr al-iksîr al-a‘zam by Jabir ibn Hayyan: L'élaboration de l'Elixir Suprême - Quatorze traités de Jâbir ibn Hayyân sur le Grand Oeuvre alchimique (edited and translated by Pierre Lory). (Damascus, 1988). Muhammad ibn Zakariya Al-Razi played a major part in the advance of chemistry. In his work Secret of Secrets, Al-Razi divided substances into animal, vegetable, and mineral. The mineral substances include mercury, gold, silver, pyrites, glass etc; vegetables substances were mainly used by physicians; whilst animal substances divided into hair, blood, milk, eggs, bile, etc. He also added a number of artificially obtained entries such as lead oxide, caustic soda, and various alloys. It is worth noting that it was the 12th-century Italian translator Gerard of Cremona who made the more valuable translations of Al-Razi's study and classification of salts and alums (sulphates) and the related operations in the De aluminibus et salibus, whose Arabic original is preserved. The many versions of this work had a decisive influence on subsequent operations in the West, more generally within mineralogy. Muslim chemical technology played a large part in the history of the subject. Equipment and unit processes are described in detail, and distillation was utilised on a large scale. The distillation industries included rosewater and perfumes, oils and fats, and petroleum. Descriptions of the preparation of mineral acids appear in the writings of Jabir ibn Hayyan, al-Razi and later writers. Such writings inform regarding nitric acid, aqua regia and sulfuric and hydrochloric acids. Alkalis were in great demand for making glass, glazes, and soap; soap which was another product of the chemical industry, hard soap being first produced in Islamic lands. 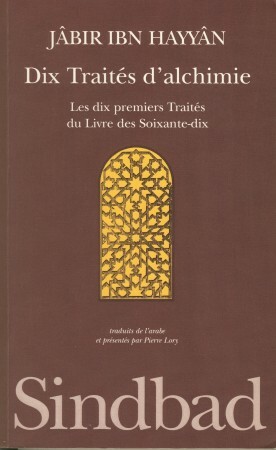 Figure 5: Front cover of Dix traités d'alchimie de Jâbir ibn Hayyân - Les dix premiers Traités du Livre des Soixante-dix (French translation by Pierre Lory). (Paris, 1983). Al-Kindi's work in the laboratory is reported by a witness who said 'I received the following description, or recipe, from Abu Yusuf Ya'qub b. Ishaq al-Kindi, and I saw him making it and giving it an addition in my presence.' The writer goes on in the same section to report the preparation of a perfume called ghaliya which contained musk, amber and other ingredients. This report reveals a long list of technical names of drugs and apparatus. A second recipe for the production of camphor is shorter, and can be found in Dunlop (1973). From these examples, Al-Kindi can be seen occupied with experiments of considerable elaboration to produce synthetic perfumes. That he engaged personally in the drug trade, however, is more than doubtful. The title of one of his lost works is A Treatise on the Artificial Production of Foodstuffs without their Elements, which describes the same kind of experiment with a different range of material. The work, Dunlop notes, was for theoretical purposes, and the experiments might have been made, for example, for the relief of famine. It is al-Razi, however, who set up the laboratory in the modern sense, designing, describing and using more than twenty instruments. Donlad R. Hill provides a good account of such a laboratory, the precursor of the modern laboratory, of which many parts are still in use today. Al-Razi does not just list the instruments used in chemistry, he also gives details of making composite pieces of apparatus, and provides the same sort of information as can be found today in manuals of laboratory art. Muslim chemistry, like other sciences, was heavily translated into Latin, and also into local languages in the 12th century. Robert of Chester translated Liber de compositione alchemise, and at about the same time, Hugh of Santalla made the earliest Latin translation of Lawh azzabarjad (the Emerald table), whilst Alfred of Sareshel translated the part of Ibn Sina's Kitab al-Shiffa (the Book of Healing) that deals with chemistry. It is, however, Gerard of Cremona who made the more valuable translations of Al-Razi's study and classification of salts and alums (sulphates) and the above mentioned book De aluminibus et salibus. The above is only meant as a snapshot of the work and progress that Islamic scientists have made within the field of chemistry. Yet their efforts are unjustifiably ignored within mainstream scientific academia. It is hoped that this injustice will in time be corrected and a greater appreciation of Islamic science can be achieved.